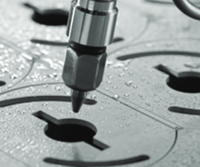 The Advanced Materials Solutions (AMS) facility in Traverse City, Michigan, specializes in manufacturing high-performance nozzles used in abrasive waterjet cutting. Abrasive waterjet applications involve fast, repetitive, or uninterrupted cutting of intricate parts in metals or other hard materials, and require the nozzles to maintain their inner diameter size to hold part tolerance and consistency. Our portfolio of Roctec® nozzles combine proprietary manufacturing processes and leading material technology to produce the best-in-class offering, leading the market in both global share and brand recognition. We currently generate $28M in annual revenue and hold 70% market share with this portfolio. In Q4 of FY18, Kennametal is launching a new grade of waterjet nozzle, which delivers 20% or more usable nozzle life over the current best product, Roctec® 500. These improvements will improve waterjet operational efficiency and flexibility, enabling fabricators to use their waterjet machines on higher value parts. Unlike our current portfolio, Kennametal is initially introducing this product directly to the end user market with a strong marketing campaign and an e-commerce platform. While we will leverage our successful channel partner strategy as a second phase to our product launch, we first want to create the market demand and value in the first phase. This phased launch strategy will enable us to drive the adoption of this advanced technology, to create the best value for our new product, and ensure that the Kennametal and Roctec brands continue to represent leading technology and consistent, reliable nozzle performance. Look for more updates on our new waterjet nozzle to be shared following its launch next quarter!